Wolves goalkeeper Wayne Hennessey and Tottenham defender Chris Gunter are out of the Wales senior squad for their friendly in Luxembourg on 26 March. The pair have instead been included in Wales' Under-21 squad for the trip to Bosnia-Herzegovina on the same day in a crucial Uefa European U21 qualifier. Hull City's American keeper Boaz Myhill gets his first Wales senior team call along with Stockport's Ashley Williams. Doncaster duo Brian Stock and Stephen Roberts are also included. "I spoke with Wayne when we were together for the Norway game to explain what my thinking was and similar with Chris," said manager John Toshack. "This is such an important game for the Under-21s because they have put themselves in a position where they can do something that they've never done before. "Qualifying for the finals in Sweden in 2009 has become a real possibility and if they do get there, all these lads can go. "The two teams travel together and we get dropped off in Luxembourg and the Under-21s carry on to Bosnia and there could be changes either way." 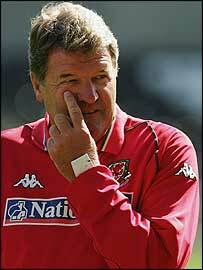 And Toshack said this was the opportunity to introduce fresh blood into the squad. "(Boaz) is playing regularly in a side who are doing very, very well," he said. "This game is one we've decided on having a look at a number of new players and he's one of them." Stockport's 23-year-old captain and centre-back Williams was born and raised in the Midlands but is qualified to play for Wales because his grandfather is from the Rhondda Valleys. Cardiff City and Luton Town both had £500,000 bids rejected by Stockport for the highly rated West Brom trainee last summer. The defender could provide valuable cover in the long-term injury absence of West Ham centre-backs Danny Gabbidon and James Collins. Wales captain Craig Bellamy is also a long-term casualty, following knee and hernia operations. But the Hammers striker, 28, says he will return before the end of the season and will be ready for the start of Wales' World Cup qualifying campaign. Myhill joined Hull in 2003 and has made over 200 appearances for the Tigers. He has played for the England youth team, but qualifies for Wales through his mum. Portsmouth defender Richard Duffy has been recalled to the set-up, with Swansea City's Owain Tudur Jones and Nottingham Forest's Arron Davies also called-up. The most notable absentee from the senior squad is Derby striker Rob Earnshaw. "But we generally want to have a look at other people this time around. "Maybe there's a bit more competition there now than there has been in the past." Those joining Hennessey and Gunter in Wales' Under-21 squad include Cardiff's Darcy Blake and Charlton defender Grant Basey, who could win his first cap. Wales squad to face Luxembourg: Boaz Myhill (Hull City), Lewis Price (Derby), Richard Duffy (Portsmouth), Neal Eardley (Oldham), Craig Morgan (Peterborough), Lewin Nyatanga (Derby), Sam Ricketts (Hull), Stephen Roberts (Doncaster), Ashley Williams (Stockport), Andrew Crofts (Gillingham), Arron Davies (Nottingham Forest), Simon Davies (Fulham), David Edwards (Wolves), Carl Fletcher (Crystal Palace), Owain Tudur Jones (Swansea), Jason Koumas (Wigan), Joe Ledley (Cardiff), Brian Stock (Doncaster), David Cotterill (Wigan), Jermaine Easter (Plymouth), Freddy Eastwood (Wolves), Daniel Nardiello (Barnsley). Wales Under-21 squad to face Bosnia: Wayne Hennessey (Wolves), Owain Fon Williams (Crewe), Chris Gunter (Tottenham), Joe Jacobson (Bristol Rovers), Grant Basey (Charlton), Darcy Blake (Cardiff), Christian Ribeiro (Bristol City), Mike Williams (Wrexham), Rhys Williams (Middlesbrough), Joe Allen (Swansea), Mark Bradley (Walsall), Jack Collison (West Ham), Shaun MacDonald (Swansea), Aaron Ramsey (Cardiff), Jonathan Brown (Cardiff), Simon Church (Reading), Ched Evans (Manchester City), Sam Vokes (Bournemouth).